Aloe Vera juice has been used for ages for it many healing properties. Ancient Egyptian medical writings indicate the use of aloe vera for healing infections and wounds, skin problems, and digestion. Aloe vera is a source of over 200 nutritional substances including amino acids. Taken internally, aloe is used to cleanse the bowels and relieve constipation. Suggestion Directions: For best results, 1 to 2 Tablespoons, twice daily. 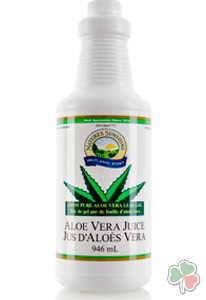 Add this refreshing Aloe Vera juice into a glass of water or natural fruit or vegetable juice. Stir and drink.